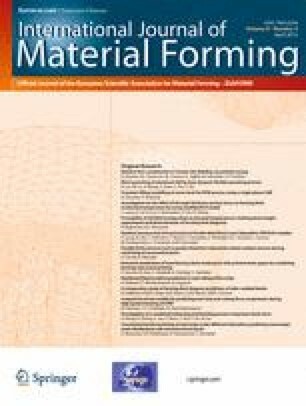 This work deals with the modeling of the material flow in Friction Stir Welding (FSW) processes using particle tracing method. For the computation of particle trajectories, three accurate and computationally efficient integration methods are implemented within a FE model for FSW process: the Backward Euler with Sub-stepping (BES), the 4-th order Runge–Kutta (RK4) and the Back and Forth Error Compensation and Correction (BFECC) methods. Firstly, their performance is compared by solving the Zalesak’s disk benchmark. Later, the developed methodology is applied to some FSW problems providing a quantitative 2D and 3D view of the material transport in the process area. The material flow pattern is compared to the experimental evidence. This work was supported by the European Research Council under the Advanced Grant: ERC-2009-AdG “Real Time Computational Mechanics Techniques for Multi-Fluid Problems”. The authors are also thankful for the financial support of the Spanish Ministerio de Educación y Ciencia (PROFIT programme) within the project CIT-020400–2007-82.